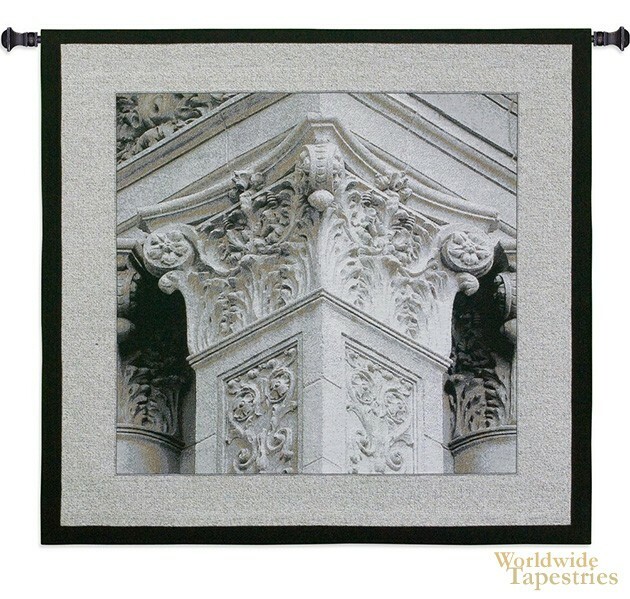 This Architectural Detail IV tapestry shows the work of artist Boyce Watt. Also known as Jeff Maihara, his works reflect the beauty of nature and man made objects with studies of them in detail. Born in Vancouver, Canada, and of Scottish and Japanese heritage, his works include those using photography and in this case, shown in the form of a tapestry. Watt travels to Australia, Japan, and South America for inspiration. Here we see a detail of an ornate architectural column with its intricate carved designs in the pillar work. This beautiful work is reflective of Watt's admiration for beauty of design. This tapestry is backed with lining and tunnel for easy hanging. Note: Tapestry rods and tassels, where pictured, are not included in the price.